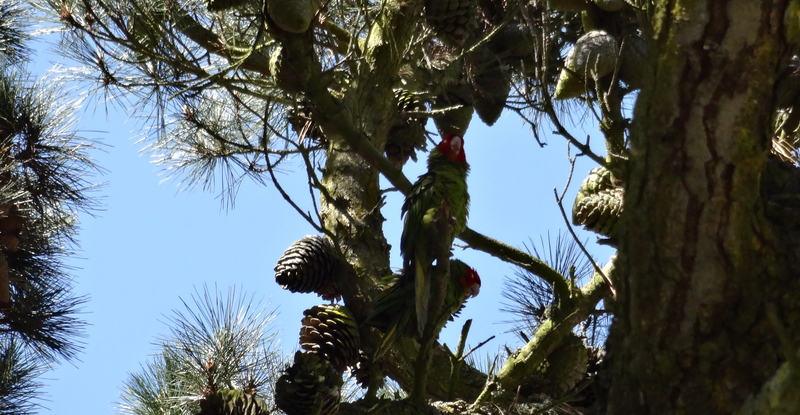 I was walking in Fort Mason Center, San Francisco, yesterday when I finally saw what I’d only heard about and seen in this documentary: The wild parakeets of Telegraph Hill. Two bright flashes of green and red, a loud bird yell, and there they were. Not at all native, part of a flock of feral parakeets that have managed to adapt to the cool, foggy weather of my home town. A little piece of the jungle by the Bay. Apparently there are two flocks now – a friend who teaches at a local kindergarten says the birds come and sit on branches outside the school windows, and are the subject of many classroom drawings. A recent article mentions at least of few of them being spotted outside of San Francisco, across the Bay – a non-native species that has done well at adapting to a climate very different from their own. San Francisco made it illegal to feed the birds in 2007, but the population seems to be successfully growing nonetheless. I saw that documentary years ago and I still see these bright little guys flying back and forth from the Presidio and my neighborhood. Love that they’re still around! They are bunch of yellers for sure. The pair I saw looked pretty intent on contributing to the propagation of the species, that’s for sure.